Issue #13 means Secret Avengers has had time to mature and become more refined. In a world filled with action story lines that relay entirely on violence, Secret Avengers gives us something we have to think about. And as the thinking heats up, well I am left wondering who will be left standing when S.H.I.E.L.D. and A.I.M. are done with each other. As the issue begins, things are not going well for our field team of Fury Jr., Barton and Romanoff at A.I.M. 's Medusa Base. Meanwhile on A.I.M. Island, Taskmaster gets something he has always wanted, an apprentice of his very own! On Maria Hill's Hellicarrier the head of S.H.I.E.L.D. verbally spares with M.O.D.O.K. (Mental Organism Developed Only for Killing). The Scientist Supreme has abandoned A.I.M. 's roots in the villain's opinion and M.O.D.O.K. will happily sell out the A.I.M. chief to get the organization back on track. At another A.I.M. base Hulk and Iron Patriot confiscate A.I.M. technology when they are attacked. As the issue closes, Taskmaster prepares to evacuate Mockingbird from A.I.M. Island but is stopped as the life of one of our team is put into jeopardy. Do you hear that? Seriously do you? Oh yeah, that is the sound of me clapping. Nick Spencer and Ales Kot provide our characters fantastic dialogue throughout this book. I loved every moment of Taskmaster's recruitment and training of his new apprentice. I throughly enjoyed the verbal sparing between Hill and M.O.D.O.K., seriously you two get a room! Even the interchanges between Barton and Fury Jr. and also Banner and Rhodes were witty smart and surprising since their small scenes could have been seen as throw away moments in other books. This dialogue is smart and fun, and reminds me of some of the best of the Marvel Cinematic Universe. I will admit, the ending is very stressful to me. We are 13 issues in, and in many ways the macro story of this title still seems to be arcing up. 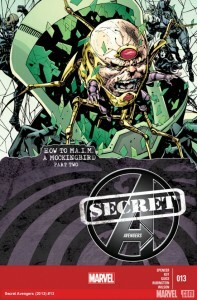 The authors give us the possibility of dead Secret Avengers, captured Secret Avengers, and double agents. I guess after borrowing a friend's copies of Morning Glories I should not be surprised. Spencer seems to understand and be a master of the long game when revealing secrets. So I am thrilled that Marvel is letting him tell a big story instead of just pushing him to get six issue stand-alone arcs out for trade paperbacks. Yes, this may be part 2 of “How to MA.I.M a Mockingbird” but this really does feel like a solid continuation of the earliest issues. Oh, and we get all this storytelling without Daisy Johnson even being mentioned! I will admit to be a little stressed at the moment Secret Avengers team. I do have some favorites amongst our little band. And right at the moment one of them is in some serious jeopardy? Where can I send the check so I can get this beloved character out of hot water? Because right at the moment Butch Guice has convinced me, there is no way out!